David Unsworth fielded a strong team, although without his captain, Morgan Feeney. But they battled away through most of the game against an obdurate Swans side, who are bottom of PL2. Manasse Mampala was electric since his introduction as a second-half substitute. He did absolutely superbly for the goal - sprinting down the left wing before keeping his composure and sending in a cross that allowed Nathan Broadhead the simplest of tasks to put Everton in front. 0-1 after 83 mins and the Blues held out for another 3 points. 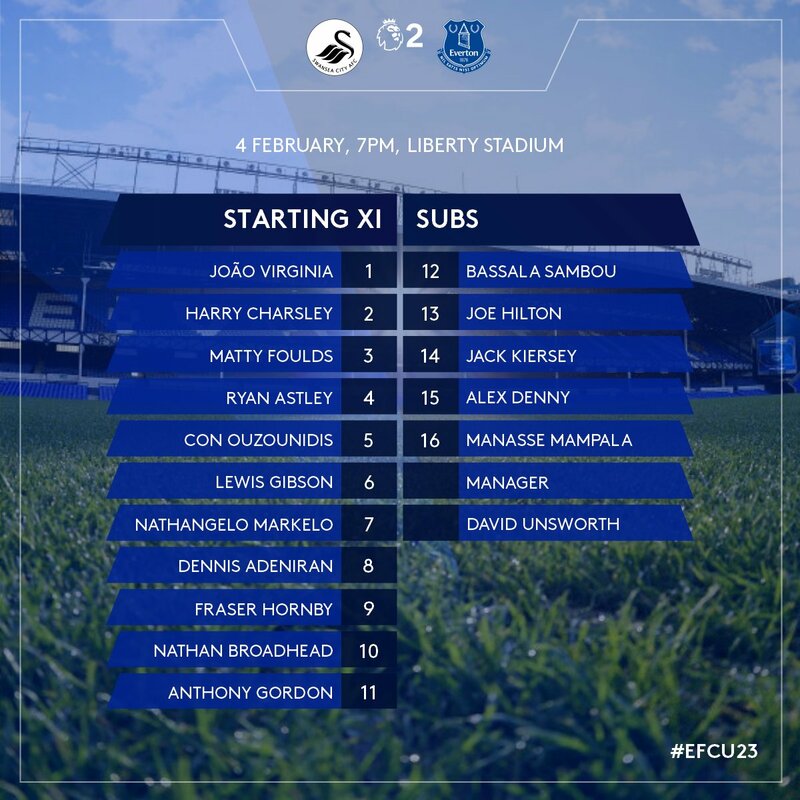 Everton U23s: Virginia, Charsley (67' Denny), Foulds, Astley, Ouzounidis, Gibson, Markelo (46' Sambou), Adeniran, Hornby, Broadhead, Gordon (75' Mampala). Subs not Used: Hilton, Kiersey. Pretty much his strongest team. I hate those scam "register for free, give us your credit card" websites. Very impressed with Adeniran so far. Fraser Hornby hasn't had much chance to show what he can do though. He must be knocking on the door, Jay. Thanks, Steve. I got dragged away. Still 0-0 into the last 10 mins. And a goal! Mampala crossing nicely for Nathan Broadhead to finish from close range. Some great play from the Blues here... but 'not a classic by any means', says yer Swansea bloke? I wish the first team could display the effort, control and concentration as those boys showed tonight. Whats this, unsworths third side? He builds sides wins things, loses all the best players and then does it all over again. Id love to see him get a championship job and do well and prove himself and come back to our first team. Steve, that would be nice. However, if David Unsworth was truly ambitious to manage a league club shouldn't he have moved on from Everton by now? Last year when appointed caretaker manager for the second time, Unsworth claimed on day one: 'I am ready for this'. Yet on not being given the gig full-time, other than some rumoured interest from Oxford United, he quietly went back to the U-23s and there he remains. Now he is doing a great job there, so Everton is benefiting, so I'm happy. But David is 45 now - 4 years older than Silva. After the bruising experience with the first team last year, has he quietly admitted to himself he isn't cut out to be the main man of a league club and is now happy and content in his comfort zone..? I don't write this as a criticism of Rhino. Just an observation that if he genuinely wants to manage a league club, the sands of time are running out on him. Any great individual performances tonight? From what Ive seen the likes of Adeniran, Virginia, Astley, Gordon and Gibson have got real talent but dont think any of them are quite ready yet. The last time Unsworth won the league, he had a group of very talented players - and got them playing for each other as a team (Marco Sílva take note). This time he has less talented individuals, but still has them playing for one another as a team (Marco Sílva take note). When he was the first team manager for a short period of time, during the home games he had the players playing for each other as a team. Theres something of a pattern here and it proves to be a successful one. Id love it if he got the chance to manage Everton again and got a full season in charge to prove himself. Sam, every player was very solid all over the park. And Virginia is not a keeper who sticks to his line on any incoming. Comes out and secures the ball very effectively. Yeah Jay (Harris), he's bene consistently good. He's 20 now though. In other words, the same age as Tom Davies. He needs to get a chance soon, or it's too late for him. I thought we missed Anthony Evans, and Anthony Gordon did not show why Bayern where looking at him. Of all the players on display it's Astley (4) and Gordon (11) who are most likely to get a look in, in the first team. Not withstanding the goalie, who is already considered part of the first team squad (note he always goes to the first team matches and warms up with Pickford and Stekelenburg, so they clearly want him involved with the first team and also note if this clashes with the u23s, he misses the u23s, not the first team). Perhaps I've overlooked our u17 World Cup Winner, Lewis Gibson (6), though. Just an update on Holgate. My Baggies supporting mate is very impressed. The only problem is he is very much a right back for them. I had hoped he would be playing centre back, but not unfortunately. Kevin #14. I think Unsy got dealt a very bad hand last time out - mostly away games and dead European fixtures meant he had very little time to work with players on the training ground. He also had no transfer window to work with. I'll always believe he should have been given until Christmas. The panic Allardyce appointment and the subsequent failed 'big gamble' this season says that the real problem (as its always been for the last 20+ years) lies at the very top. I'd have loved to have seen him get a real opportunity to develop our youngsters in the first team and create some real team spirit rather than the spineless take the money and run mercenary outfit we have become. Rhino was and is a fantastic servant for the club. Not everyone in life aspires to the top job wherever that may take them. Family, etc, plays a big part too. I imagine he is sufficiently well rewarded and that he gets immense pleasure and pride seeing his youngsters perform so consistently well. I was hugely disappointed when it didnt work out for him last year and believe he should have been given more time. However, I am also delighted that he has remained at the club he loves and is doing such a sterling job. He may yet get a second chance to shine at a higher level within the management structure .....and he would have my total support. Just wish we could put him back on the pitch. In recent interviews, Unworth has been particularly complimentary of Virginia, Browning, Feeney and Astley. Three of those are no surprise, but Browning? Could he actually still have a future with the club? I actually hope some of these teenagers aren't given a first team chance just yet. Everyone develops at a different rate but I'm more than happy if the better ones stick around for a few more years, then maybe have a loan or two and by the time their 23/ 24 are ready for first team action. I know everyone loves a teenager to break through and have hope he'll be the kid to take us to the next level but it's incredibly difficult for any single player to drag his under performing peers forward never mind a teenager with little experience. Build a solid foundation of a team and squad and then in a few years add the missing ingredients. Watch them play as a team, fight for each other and get used to the graft and hard work before they earn millions, not the other way around. Besides we have a transfer ban on youth players so that may help to develop a settled team and winning mentality. For me, after suffering the expected hammering on wednesday, Silva should be given his walking orders and Unsworth given a 5 month contract. Someone who can get the team spirit back, someone who will test our young players, and who knows how he'd do in the long run, but it deserves a shot. Fran, In fairness to Unsworth his PL record on a points per game basis was similar to Allardyce last season, albeit the number of games was massively different . The heavy defeats in Europe did him in, especially the Atlanta game coming hard on the heels of the Southampton drubbing. However, if he was given another go, I would discard my season ticket and never watch again, as it would just further confirm us as a club without a clue. dealing with crosses, dealt and anticipated every centre. Ham squandered some good chances to win the game. Earthlings, definitely off another planet. I raised the point on the Wolves pre-game piece and working on the numbering in Michaels #2, are we playing Foulds, who we signed as a central defender from Bury or Barnsley or the like, at left back as, like the 1stXI, we have nobody at the moment. Of course, it could be that he is a better left back than central defender or is getting experience in all defensive positions. There does however seem to be a shortage of left backs throughout the club with the exception of the on loan list. Someone from this squad has to be knocking on the door of the first team. The way our season has gone I'd much rather see a few players develop than just kick on with the current crop. Maybe we could try to fast track Fraiser Hornby, Anthony Gordon, Ellis Simms or Lewis Gibson a bit just to keep up the production line of our younger lads. Sometimes these young lads are not ready but sometimes they just need a chance, look at what it done for Marcus Rashford. Simon, from last night's performance, I wouldn't say any of this squad are knocking on the first team door. That's not to say we don't have talented players, just that the best of them lack experience yet: Virginia, Astley, Gibson, Adeniran. Two have promise but have yet to deliver it at U23s: Gordon and Hornby. Four others who started are decent U23s players, have served the club well, but are not going to be first-team players: Broadhead, Charsley, Foulds, Ouzounidis. I would say though that three of them I would consider “3rd choice in their positions” so who knows what might happen if injuries occur: Virginia, Gibson as a left-back, Astley as a right-back; though Gibson and Astley are decent centre-backs, I think their first opportunities may come at full-back. Phill (29), I would agree with your post, what is confusing is why James McCarthy hasnt been getting a run out in some of these games, he is legible to play, why is he being held back? seems strange to me. Alan, Matty Foulds was always a left-back / centre-back. There's nothing new there. It was hoped he'd become a centreback. However, it's always hard to tell as that requires physical development that may not happen. Matty is not a giant, but he seems tall enough at U23 level. Feeney is a tall lad (6'-2"?) and Foulds is not as tall as him. I see a big problem with Fraser Hornby. He is not a finisher. He was a central midfielder, a box to box type, for most of his time in the youth ranks. He always scored goals, but not prolifically so. However, young Fraser had a sudden growth spurt. This meant that he was suddenly a very big lad for his age. He was given games up top as his age group lacked a target man and Hornby had always had a good leap on him. Suddenly he was a number 9 and his midfield background meant he had good link up play. Hornby is neat and tidy, solid in the air, and has good technique. He has a great shot on him, and if you've heard of him, it's because of his spectacular long rangers for Scotland. What you won't find much evidence of though, is the striker's bread and butter, the tap in. Hornby just never seems to be in the right place at the right time. He seems to lack the strikers instincts. I fear this will prevent him, in the big leagues, from becoming a top level professional. Dave #25, my two visits across the park last year re-confirmed everything I have ever thought about them. In particular the game in December when I met you before kick-off, then sat amongst them in the Kemlyn Road, they were howling at Klopp during the last 15 minutes, then as I left at the end I was going down the steps as hundreds of them who had left early came running back into the ground. If it takes a defeat tomorrow then us beating them on March 3 to stop them winning the league, for me it will drag something positive out of this lousy season. Sorry, I try to be measured with my posts. I'm not bitter, I just loathe them. Peter (34), I understand how you feel. I've met you so I know that deep down you would acknowledge good play even if it came from them, would admit foul play by us, and in general be fair to how a game was being played, and have no problems in just telling the truth about the game. We all have a bit of bias, especially in the heat of the game, but to deny that certain parts of the game are not happening when it is right in front of you beggars belief to me, and that is what I saw, in a pub to be honest, and I couldn't act like that. I eventually said to a fella I knew, a red, “If people who didn't know us, watched us talking tonight, they would think you were an Evertonian and I supported your team." Mike Gaynes pointed to the scores of red fans leaving that game at Anfield with over ten minutes to go, lots of them shouting abuse at their team, a bit like their manager, full of smiles when his team is winning, the complete opposite when it goes against them. I echo your next to last paragraph. Steve(#32); Thanks for that and it is the second time that has been said about one of our players, the other, on another thread, being Galloway. How old is Foulds, are we to be made fools of again by a sudden growth spurt or do we not do a lot of scouting/assessment before buying? Or, with Ray Wilson in mind, do we have a coach in there somewhere using some nous. Dave (30), first-team squad members are not obliged to play for the U23s, so maybe McCarthy simply didn't fancy it, preferring his route back to be via the first team subs bench. Funny, it doesn't seem that long ago that it would make headline news if a first team player refused to play for the 'reserves'. Steve (37), thanks, I didn't realise that because Niasse and a couple more (I think) have played for the U23s. Maybe James has his reasons for not playing. I would love to see a fit McCarthy back in the team; hopefully he will play very soon.